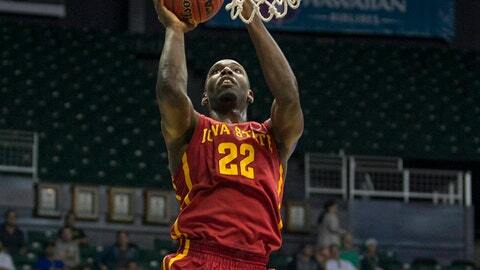 Iowa State forward Dustin Hogue (22) makes a layup over George Mason at Stan Sheriff Center. Iowa State didn’t need all of its high-powered offense to remain undefeated after its first game in Hawaii. Georges Niang scored 22 points and the 17th-ranked Cyclones beat George Mason 79-67 on Sunday in the first round of the Diamond Head Classic. The Cyclones (9-0) had their second-lowest scoring game of the season but still managed to extend their winning streak. Iowa State — the top scoring team in the country — was one of 10 undefeated teams in Division I at the start of Sunday. "They slowed us down," Iowa State coach Fred Hoiberg said of George Mason. "We had really good looks against their zone, it just didn’t drop." Hoiberg said his team struggled during its first game on the islands. "It’s always tough to get legs under you after 2 days of having activities, going out to Pearl Harbor and experiencing that, and guys at the beach a little bit," Hoiberg said. Melvin Ejim, Iowa State’s leading scorer going into the game, had 14 points and 11 rebounds while DeAndre Kane had 13 points and eight assists. Patrick Holloway scored 19 points for George Mason (5-5) and Byron Allen had 14. The game was played amid tight security among arrangements made by the White House for President Barack Obama to attend the tournament’s second game, Oregon State against Akron. Obama’s brother-in-law, Craig Robinson, is the head coach of the Beavers. "I’ve never seen it take 25 minutes to get into a game," Niang said. "That was pretty wild but Barack Obama is supposed to be here so I understand the principle behind that. That’s pretty awesome when the president is around." Players for both Iowa State and George Mason were screened with metal detectors as they entered the arena Sunday morning. "I’ve never had them check my bag. I have no problem with that but it felt like I was going for a flight," Kane said. Three minutes into the second half, Niang stole the ball from Marko Gujanicic and his layup gave Iowa State its first 10-point lead at 40-30. After that, George Mason pulled no closer than five points with 6:18 left. Kane said the game changed for his team when it started pushing the pace in the second half. "We needed to speed up the pace and play the way we play," he said. "We got caught up playing mostly the way they play, slow, late in the shot clock and that’s not the way we play." Iowa State made just three of 14 3-point attempts in the first half (21 percent) but the Cyclones used a 10-2 run to avoid their worst half in any game this season. Iowa State scored 34 points in the first half; its season low is 29 points in the first half against Northern Iowa on Dec. 7. Niang gave Iowa State its largest lead of the game with little more than 2 minutes left, hitting a 3-pointer at the top of the key. After making the shot, Niang trotted backward down the court with his arms outstretched and signaling threes on each hand with his pinky, ring and middle fingers. It was Niang’s third straight game with at least 20 points. Iowa State shot 52 percent in the second half after shooting 40 percent in the first half. Iowa state scored 45 points in the second half — its season low in a second half this season is 42 points. "They just asserted themselves," George Mason coach Paul Hewitt said. "We turned the ball over early in the half and they got themselves a lead, got themselves a working margin."